Shortly after construction begins on the Edward M. Kennedy Institute for the United States Senate this spring, its president — handpicked by the senator just before his death — plans to make his exit. The unexpected resignation of Peter Meade, combined with the recent departure of the chief executive of the John F. Kennedy Library Foundation, is fueling a growing sense in Boston’s political circles that there is confusion and conflict behind the scenes among the keepers of the vaunted Kennedy legacy. 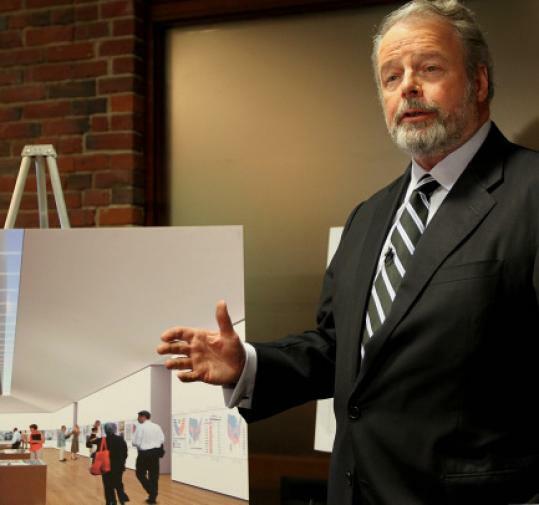 In an interview, Meade, a longtime team player with the Kennedy family and one of Boston’s leading civic figures, confirmed he is leaving the institute, but insisted his departure is amicable. He said he told the institute’s trustees in December that his expertise was to clear the way for the construction, but that the facility will then need a director who is well versed in its educational and highly technical systems. “I have a lot of tools in my tool box, but that is not one of them,’’ Meade said, referring to high tech systems that the institute will use to educate young people about the Senate. He said he will be gone soon after the groundbreaking for the $60 million facility, which is scheduled to take place April 8. Reports of Meade’s departure after little more than 18 months in the position have caught his friends and colleagues off guard, but not completely by surprise. While none would speak for the record, they have said he was not comfortable in the position, particularly with the intense interest that Kennedy’s widow has in the day-to-day operations. Vicki Kennedy did not respond to requests for comment. Meade denied there was any tension between the two of them or that he had conflicts with any of the board members. Meade initially declined to confirm or deny his status, but eventually confirmed his decision to leave when the Globe pressed the issue with the chairman of the institute’s board. “I have not noted one iota of tension or friction or acrimony at all,’’ Fentress said. The Institute is constructing a 40,000-square-foot structure that will be part of the University of Massachusetts Boston. The largely one-story building, which will look out over Dorchester Bay, will be located next to the presidential library but is not part of it. To be sure, the institute appears to be on track, despite some setbacks in federal funding. With Boston philanthropist and health care entrepreneur Jack Connors leading the effort, it has almost reached its fund-raising goal of $125 million and should be ready to open within the next several years. But Meade’s planned departure comes just several months after another Kennedy family institution, the presidential library on Dorchester’s Columbia Point, saw its president step down after only a year on the job. David McKean, a scholar who served as a top staff member for Senator John F. Kerry until 2009, has moved back to Washington, leaving the library position, which had seemed ill-matched to his skills. The abrupt departure of both men has come at a time when the family — stripped of its patriarch in August 2009 — appears to have lost some of the respect and clout that gave it cohesion and kept its legacy intact. Adding to the sense of drift is the fact that the family no longer wields its influence in the state’s political power structure. Kennedy and his brother John were major forces in Massachusetts politics for nearly 60 years. Republican Scott Brown’s stunning election last year to fill the seat that the Kennedy family held for all but two of 46 years was a serious blow to the family legacy. Vicki Kennedy recently closed the door on a potential challenge to Brown next year, dimming hopes of a Kennedy resurgence and Democrats’ hopes of regaining the seat. On top of it all, another one of the late senator’s pet projects, the Rose Fitzgerald Kennedy Greenway, is struggling to realize its original vision as a centerpiece for Boston’s downtown. Political observers say that Senator Kennedy was the force that maintained the family’s influence and made sure its operations ran smoothly. While many Kennedys have succeeded in both private and public lives, none in the next generation seem to have the stature to fill his shoes. Jeffrey M. Berry, a Tufts University political science professor, said it should be no surprise that the senator’s death has diminished the Kennedy family’s standing, given his influence in national and state politics over the past 50 years. Political observers and family insiders say the relative most likely to pick up the mantle is 30-year old Joseph P. Kennedy III, son of the former congressman and a prosecutor in Barnstable County. He looked at running for Congress last year but decided against it. The late senator created the institute as an educational and research center for the study of the Senate, its history, and its role in the governing process. It will also house the papers from his 47-year career, during which, according to many, he built a reputation as one of the greatest US senators. It is funded by about $38 million in federal grants and $125 million from a fund-raising campaign that is seeking donations from corporations and individuals. The use of the federal funds has brought criticism, particularly in the charged political atmosphere in Washington, where the new Republican House leadership and President Obama have taken aim at earmarked spending projects. About $8 million in funding for the institute fell victim to the policy.